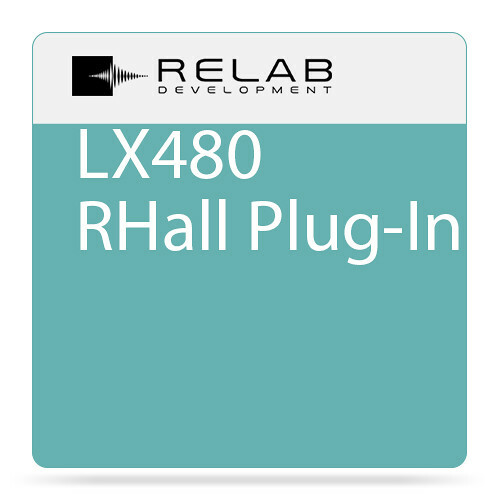 The electronic download of the LX480 RHall Plug-In from Relab Development is a recreation of the Lexicon 480L Digital Effects System* RHall reverb effect. The original Lexicon hardware unit has been a standard for over two decades by which other reverb signal processors are measured. This plug-in emulation of that hardware unit can be used by musicians, engineers, and producers for Mac or Window computers and is compatible with any VST, AU, or AAX host applications. Besides having a faithful recreation of the RHall algorithms, the plug-in has continuous controls, flexible and additional filter structures, more ER delay lines, and stereo manipulation with 88.2 kHz and 96 kHz support. The controls are quick and the display is customizable with sliders for Hue, color saturation, brightness, and background graphic can also be modified. Furthermore, the dual engine software lets you select between four routing configurations with different algorithms in each engine for extra-wide reverberation. The interface for the LX480 plug-in is based closely on the LARC (Lexicon Alphanumeric Remote Control) from the original unit. If you're familiar with the LARC, you'll find operating the LX480 very comfortable, with the benefit of extra visual feedback and control and editing capabilities. *Lexicon, 480L Digital Effects System and 480L are trademarks of Lexicon Inc. which are in no way associated or affiliated with Relab Development. These trademarks of other manufacturers are used solely to identify the products of those manufacturers whose sounds were studied during the development of the plug-in. Faithfull recreation of the Random Hall reverb algorithms from the Lexicon 480L*. 88.2 kHz and 96 kHz support. Algorithms with higher density than found on the original hardware reverb version. Custom: This option allows for a custom skin to be used.